TSPSC 2,437 Various Posts Recruitment 2017 Apply online @ tspsc.gov.in: TSPSC 2,437 Various Posts Recruitment 2017 in Different Departments of Telangana: Residential Degree Junior Colleges Teaching, Non Teaching Posts, Assistant Executive Engineers, Veterinary Assistants, Veterinary Assistant Surgeons, Deputy Surveyors, Forest College Posts to filling up by the TSPSC. 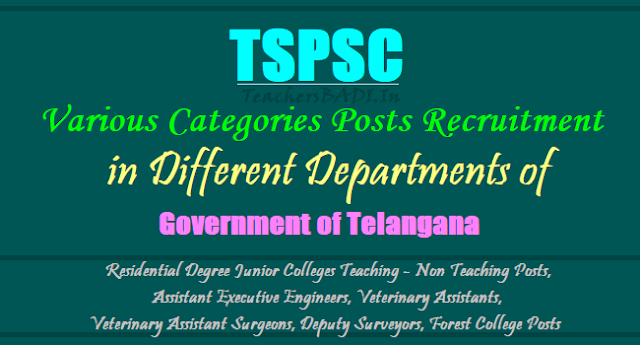 As a boon to the job aspirants on the occasion of State Formation Day, the Telangana State Public Service Commission (TSPSC) has given 15 notifications for recruitment of posts in various government departments on June 1. The Telangana State Public Service Commission (TSPSC) notifying 2,437 jobs through 15 notifications. The 15 notifications have come as a bonanza for unemployed youth in the State, which is celebrating its third Formation Day on Friday. Youngsters had been eagerly waiting for notifications to posts of degree college lecturers and junior college lecturers in government-run colleges. Notification for the filling up of posts in Social Welfare Gurukul Residential Junior and Degree Colleges and government departments numbering 2,437 are issued on State Formation day on June 2. Among these are posts of principals, lecturers, civil engineers and veterinary doctors. TSPSC would take up recruitment for 546 posts of degree college lecturers, 21 posts of degree physical director, 21 posts of degree college librarians of Residential Educational Institutions Society (REIS). Six(06) posts of principals, 08 posts of physical director, 152 Junior lecturers, 42 librarian of Residential Junior Colleges, This apart, the Commission also issued notifications for 304 posts of principals of Residential Schools of REIS and 30 posts of principals of residential degree colleges. 463 assistant executive engineers in in civil, electrical, mechanical & civil/mechanical in Irrigation and CAD Department, Roads and Building Department, Ground Water Department and Tribal Welfare Engineering services.Applications are invited Online from qualified candidates through the proforma Application to be made available on Commission’s WEBSITE (www.tspsc.gov.in) to the post of Assistant Executive Engineers in Various Engineering Services in the State of Telangana. Seven(07) posts of veterinary assistant surgeons.Applications are invited Online from qualified candidates through the proforma Application to be made available on Commission’s WEBSITE (www.tspsc.gov.in) to the post of Veterinary Assistant Surgeon (Class-B) in Animal Husbandry, Dairy Development & Fisheries Department. Four(04) posts of inspector of boilers...Applications are invited Online from qualified candidates through the proforma Application to be made available on Commission’s WEBSITE (www.tspsc.gov.in) to the post of Inspector of Boilers in Boilers Department. 273 posts of deputy surveyors of land. Notifications were also issued for recruitment of 273 deputy surveyors in Survey Settlement and Land Records Sub-ordinate Services. Applications are invited Online from qualified candidates through the proforma Application to be made available on Commission’s WEBSITE (www.tspsc.gov.in) to the post of Deputy Surveyors in Survey Settlement and Land Records Subordinate Service. 19 posts of professor and librarian and others in Forest College: Nineteen posts including those for professors and librarians in the Forest College and Research Institute at Mulugu were also notified.Applications are invited from qualified candidates through the proforma Application to be made available on Commission’s WEBSITE (www.tspsc.gov.in) to the post of Professors, Associate Professors, Assistant Professors and Librarian in Forest College and Research Institute, Mulugu. Submission of online applications for all the 15 notifications will commence from June 6 and the last date is June 24 for some notifications and July 11 for a few. The Commission also announced tentative dates for conducting preliminary screening test for posts in REIS on July 16. The Commission, which said it intends to complete the recruitment process by August-end, advised candidates to visit its website www.tspsc.gov.in for detailed information, for submission of online application and dates of examinations. TSPSC Chairman Chakrapani said that the Commission did not receive any indent from the TS Education Department for filling posts of teachers in Government schools. He said that as soon as the district wise posts details are received, recruitment process would be taken up in Education Department. News of 8,792 teacher posts to be filled by TSPSC: The stage is set for filling 8,792 vacancies in government sc­h­ools in next few weeks th­ro­u­g­h Telangana State Public Se­rvice Com­mission. Notification would be issued in next few weeks. Deputy Chief Minister and Minister for Education K Srihari said that till the process of recruitment was completed, government would appoint Vidya Volunteers so that the academic activity continues uninterrupted from the beginning of the academic year. Srihari said that Teacher Eligibility Test (TET) would not be conducted as already three lakh qualified candidates were available. The recruitment would be done by taking undivided 10 districts into consideration. The government would appoint 11,428 Vidya volunteers and 8,792 teachers this academic year. The services of Vidya volunteers would be drafted ahead of the notification to be issued by the Telangana State Public Service Commission for recruitment of teachers to fill the existing vacancies in various schools across the State. 2 Degree College Principals 30 24-06-2017 Interview …..